The following is taken from the back cover of the printed edition (update 11.14.14). 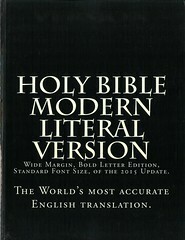 The "Modern Literal Version" uses the Majority Text ("The New Testament in the Original Greek Byzantine Textform 2005 Compiled and Arranged by Maurice A. Robinson and William Pierpont"). Two distinct and opposite techniques are used in translating the New Testament from the Greek. 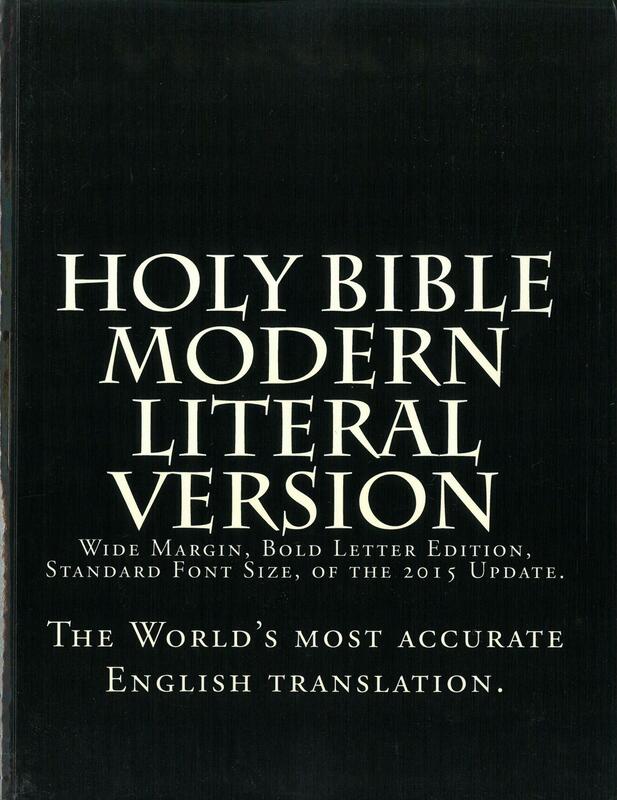 The "Modern Literal Version" is the first type, a 'literal' translation sometimes called 'word-for-word' translation. The second and most common in the past 30 years is to paraphrase the Greek into English. These are: dynamic equivalence, free style, thought-for-thought , better than a word-for-word and so on. We understand the value of paraphrases for those looking for a Bible that reads as easily as a newspaper, however we feel strongly about having a Bible without opinions of what was meant but instead faithfully reproduces the original Greek Bible into Modern English. One way to look at this is: if there was a court case with a particular document that was being used as evidence and this document was in a foreign language would a "thought-for-thought" translation be acceptable? The 'document' we are talking about here is the 'Last Will and Testament' of our Lord Jesus & Savior. The goal of everyone who worked on the "Modern Literal Version" was to keep any form of commentary or paraphrase out of this translation as is humanly possible. The MLV is not sold for profit because there is no denomination or publishing company or foundation behind it. All Christian groups have had the opportunity to submit fixes or help. The only uninspired traditions kept in the MLV are: punctuation and capitalization; chapter and verse numbers; and book order. 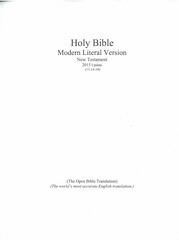 The Open Translation Bible: The Modern Literal Version Bible is considered 'finished,' although it has been open for revision by anyone since 1998. Our utmost desire is to have a translation that has no errors and we believe that the best way to produce an error-free translation is to keep it open to the public in the same manner as 'open-source software' is to programmers. We have found no better way than our 'open translation' idea in its 15 years to achieve this goal. Absolutely anyone in the world is able to contribute, for sure, the few million who have visited the Christian Library have had that opportunity. Click here for sample verses from the Modern Literal Version. 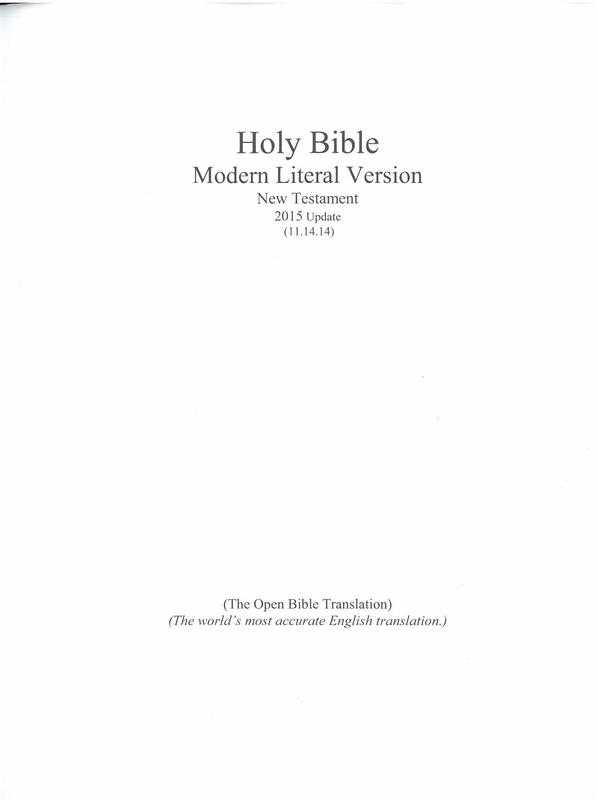 Subtitle: (The Open Bible Translation / The world's most accurate English translation). Wide margin, Bold letter edition, Standard font size.